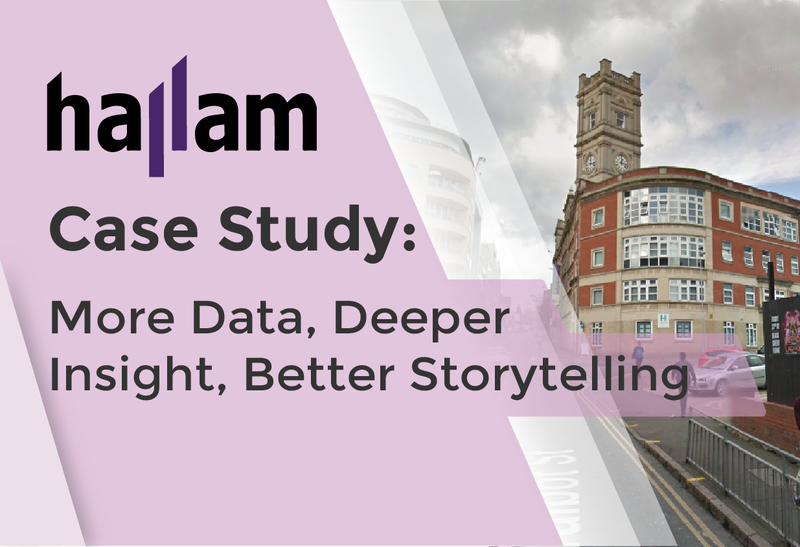 Nottingham based digital marketing agency Hallam was in the market for a new reporting solution. Ben Wood, Marketing Services Director, set out to find the best of the best, organising free trials with every tool he could find. All fell short of the mark. While searching G2 Crowd for comparisons, he found NinjaCat, the rest is history. Hallam wanted to differentiate themselves from the competition. They noticed that their clients were growing larger, and they decided to bring marketers in house. Client reporting soon became their most important tool to communicate value to their clients and show that their set KPIs were being hit. Clients requested deeper insight into campaigns, which is why Hallam ultimately chose NinjaCat. Before NinjaCat, Hallam used Google Sheets with a GA add-on. With no central platform, this solution made building their client reports a tedious, expensive and time-consuming process. The platform combination was, as Ben describes, quite clunky and challenging to setup and manage daily -- simply not equipped for scalability. There was no customer support, an essential for Hallam and a cornerstone of NinjaCat's offering. Seeking to grow along with a rapidly expanding client base, Hallam needed more sophisticated ways to manipulate and display client data. Report creation needed to be automated. Hallam's reports clearly illustrate the strategic value their team brings to client's digital campaigns. The addition of integrated client KPI progression tracking completes the picture. Anyone can run a GA report, but Hallam wanted to be above that bar. They knew they were risking clients by not implementing a functional, impressive reporting solution. Hallam chose NinjaCat for its depth of customisation as a way to stand apart from competitors and in house marketers. Storytelling became a central idea in communicating data to clients. They were able to bring in a torrent of new additional data sources for their reports, thus enabling them to utilize data storytelling to make campaign results more compelling. 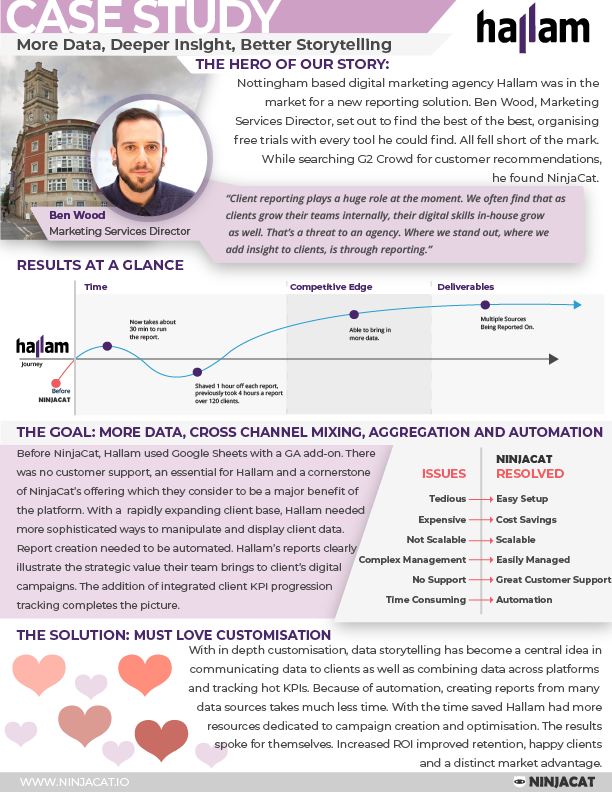 Combining data across platforms and tracking hot KPIs that resonate with their clients was the path to success Hallam opted for by choosing the NinjaCat solution. One interesting result Hallam soon took note of came from the automation side. Because many processes were now automated, they were able to combine many different data sources and compile large, in-depth reports with much less time spent on preparing the data. Immediately, the ability to work with more data and combining that data in different ways was something that set their reports apart from competitors who were not using NinjaCat. With the time saved Hallam had more resources dedicated to campaign creation and optimisation. The results spoke for themselves. Increased ROI improved retention, happy clients and a distinct market advantage. By solving their reporting needs, they now are able to focus on strategising and building quality campaigns. This adept, tactical planning further solidifies the value that Hallam brings to their clients. Hallam is now seeing happier clients, improved retention rates and views their reporting as an advantage against many other agencies. If you are looking to provide deeper insights with more data to your clients, sign up for our quick demo and see the potential of the NinjaCat reporting solution. More Data, In-Depth Analysis, Cross Channel Mixing, Aggregation and Higher Quality Campaigns lead Hallam to a competitive edge in the market.